Senators Levin and Merkley are pushing to ban proprietary trading. Senator Collins wants banks to boost capital requirements. And Senator Cantwell wants Glass-Steagall back. These and other amendments are being jammed into the financial regulation overhaul bill at the last minute—and, as a result, have further delayed a vote on the bill. Moments ago, Democrats failed to pass a motion that would have ended the debate on financial regulation and thus forced a show of hands. (Two Democrats crossed party lines, so the debate continues). Even if the fight to pass the bill isn't turning out to be as bloody as the one that surrounded health care reform a couple months back, it's nonetheless shaping up to be a heated battle that will go down to the wire. 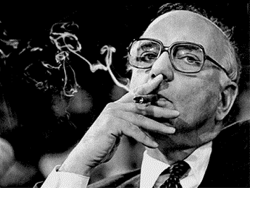 Particularly heated is the fight over the "Volcker rule," named after the ex-chairman of the Federal Reserve, Paul Volcker, who proposed forcing banks to place all proprietary trading operations into subsidiaries. Of course, firms such as Goldman Sachs and J.P. Morgan that have been killing it recently (pitching perfect first quarters) and pretty much living and dying by the prop trade are not too pleased with Volcker and his rule and you can bet your sweet mortgage-backed securities that these banks and a few others will most definitely be lobbying against it up until the moment of vote. Goldman, which has been the Senate's punching bag of choice as of late, had enjoyed a quiet week and a half out of headlines until this morning when Bloomberg published a piece about Goldman making billions of dollars while its investment recommendations to clients turned out to be big losersand the Times ran a lengthy piece about Goldman's alleged conflicts of interest with its clients. The Times piece pointed out that any employee who joins Goldman Sachs is supposedly given a tutorial on Goldman's 14 core principles. The first principle is "Our clients' interests always come first." And, perhaps not too surprising, the 14th principle is "Integrity and honesty are at the heart of our business."